Love Life and Pizza. Now that sounds like a pretty good mantra. It also just so happens to be the slogan for Brick + Wood, the latest Italian spot to open in Fairfield. The husband and wife team, Paolo and Clara Cavalli, opened Brick + Wood as a celebration of Italian culinary heritage. The restaurant concept developed out of Paolo’s childhood in Italy and his roots in the family’s restaurant business here in Fairfield County. 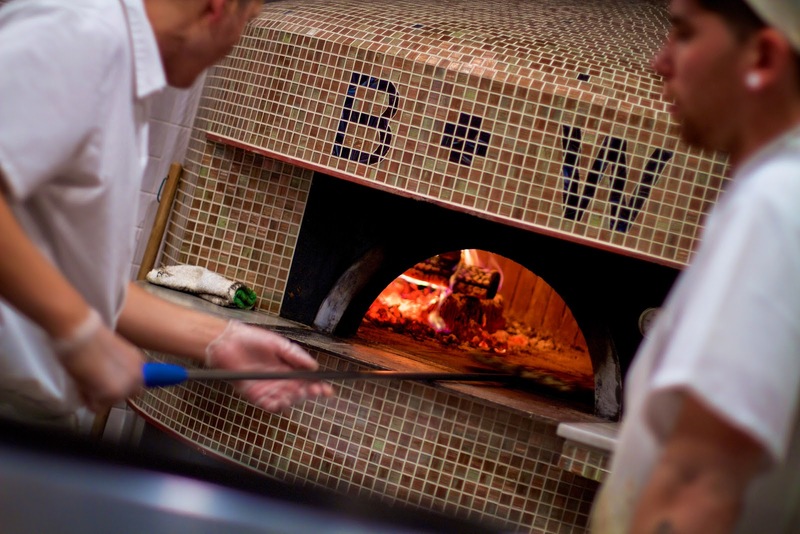 Brick + Wood isn’t the usual Italian joint; it’s all about Italian street food. 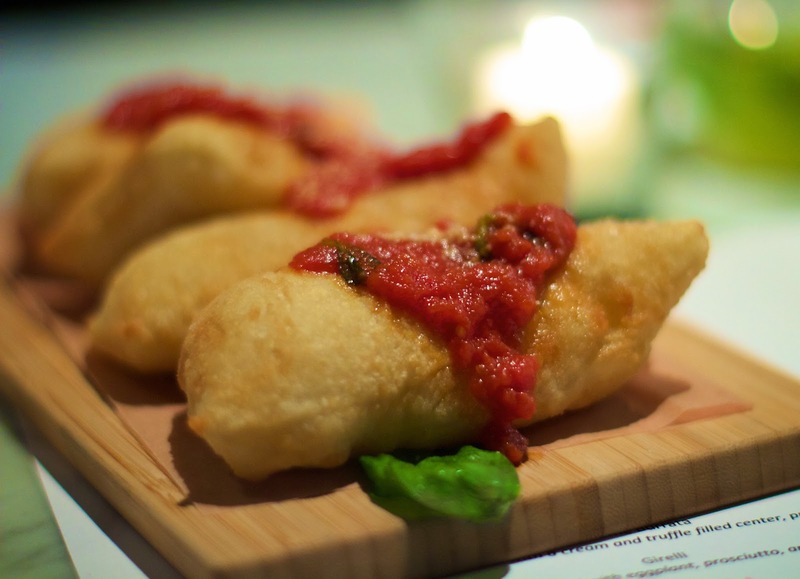 It features the fun traditional finger foods and shareable noshes you would see Italians eating from street vendors while strolling the streets or taking a break in a piazza. 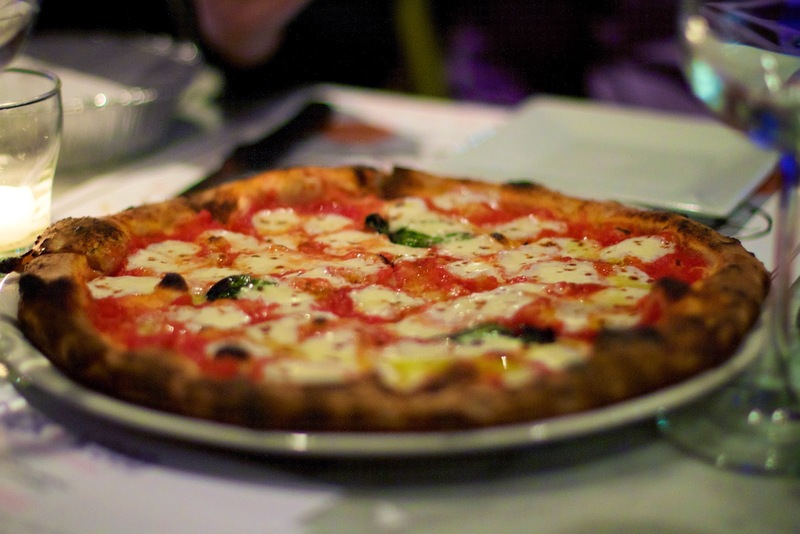 Plus, it’s wood-fired thin crust pizza and fresh made burrata - oh, the burrata. Before I get ahead of myself, let’s first talk about the vibe. It’s an inviting, casual vibe that’s hip enough for date night, but still works perfectly for families. As you enter there’s a cozy bar room to your left and the rest is an open dining space. At the back of the dining area, is the open kitchen with a tiled beehive wood-burning pizza oven and an expansive butcher block and marble-topped mozzarella bar complete with counter seating. 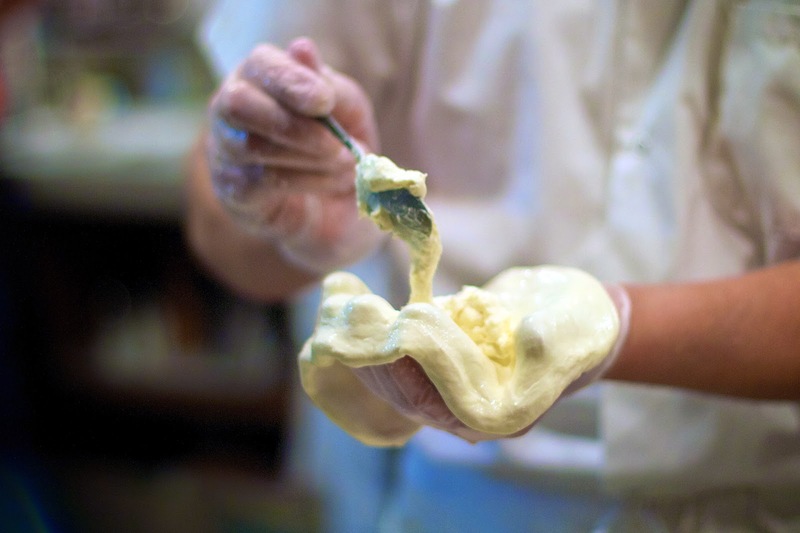 Yes, you can just grab a seat at the counter and check out the action as they make that aforementioned burrata right before your eyes. Brick + Wood is home to the area’s first all-tap wine service, with an impressive 30 taps in all. The tap system maintains the integrity of the wine and keeps it at the optimum temperature of 55 degrees Fahrenheit. If you are unsure what to choose, just get a flight. Yes, you can get a flight of wine. 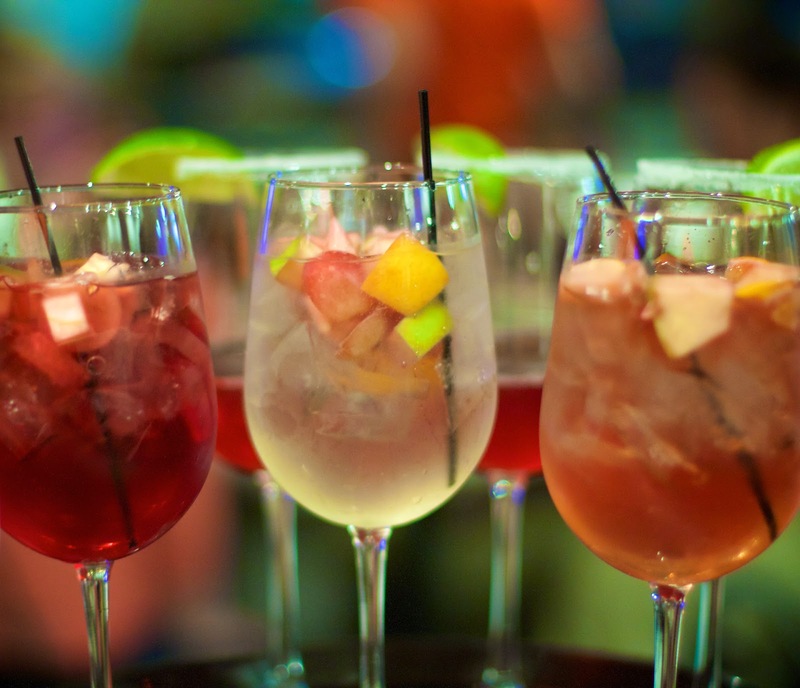 For a fruitier take on things, there are three types of sangria – a white, red and rose. Even though I’m not a white wine drinker per se, the white wine sangria was my favorite with nice balance of sweetness. There is also a slew of house cocktails as well as dessert cocktails. The menu is broken down into Neapolitan Street Food, Mozzarella + Homemade Burrata Bar, Antipasti, Salads, Pizza, Panini, and Dessert. There are gluten free and vegan options available. 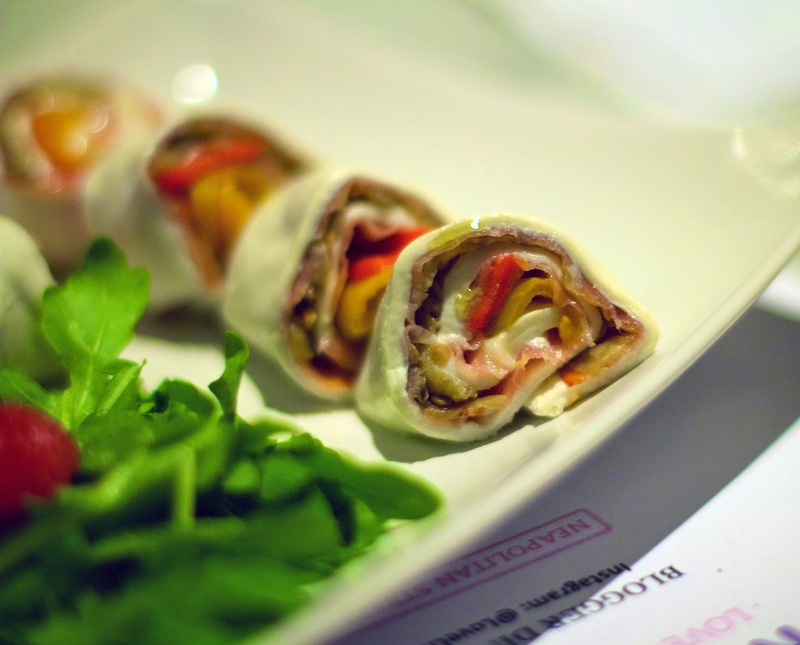 We began with three Neopolitan Street Food items. 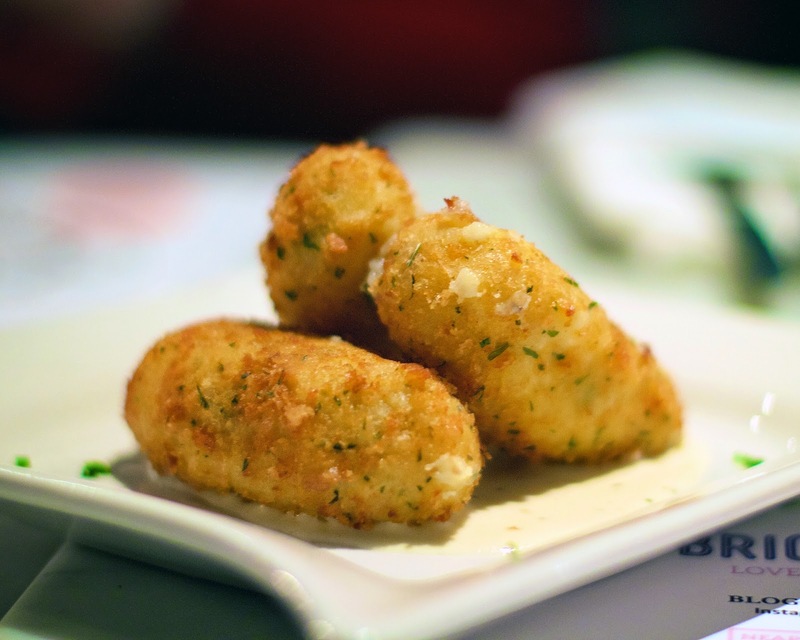 The lightly fried crust of the Loaded Baked Potato Croquettes gave way to a creamy mashed potato inside flavored with bacon, chives, and cheese. For me, it was a touch salty, but that didn’t stop me from eating it all. The Montanara Pizza Fritte was airy and not greasy. This fried dough was incredibly light. 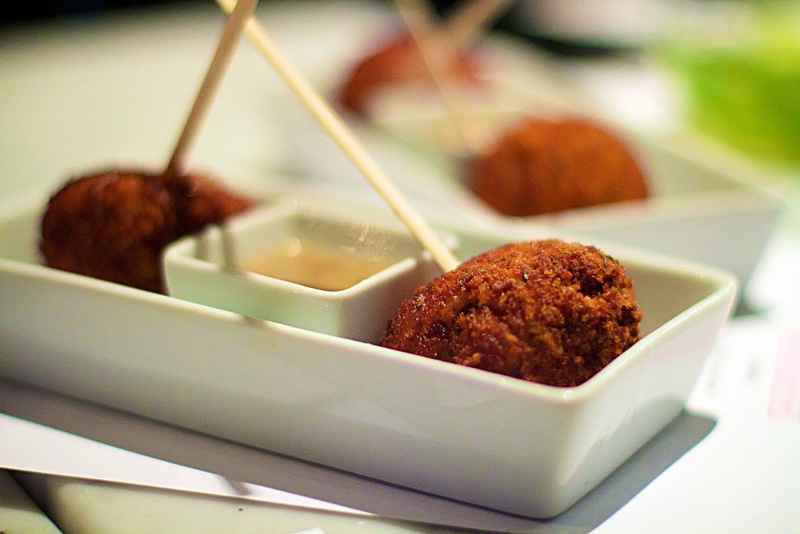 The Aranici were stuffed with pear and gorgonzola with a sage brown sauce. I loved the earthy and sweet interplay of flavors from the tangy cheese and pear. The firmer pear texture was a nice contrast to the cheesy, softer rice. Then it was on to a smattering of mozzarella and burrata bar dishes. 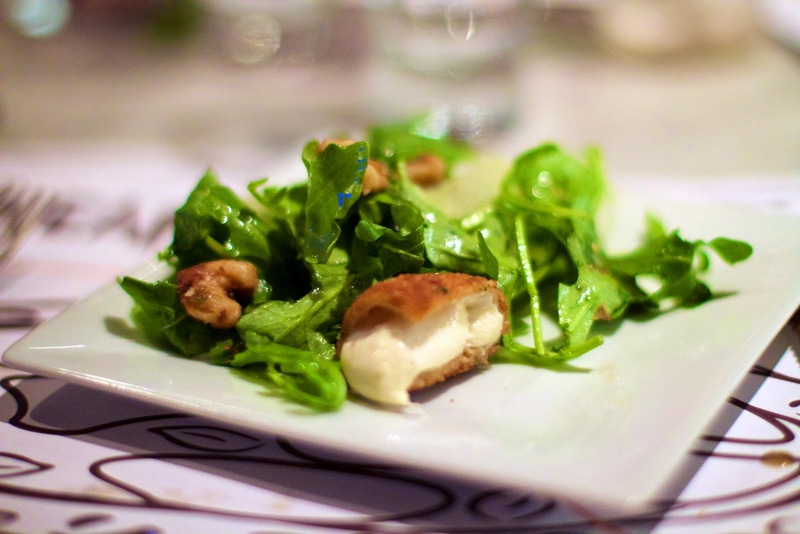 The Arugula Salad featured arugula, pear and candied walnuts in a maple vinaigrette with fried bocconcini. It was peppery and sweet. Now, for the Truffle Burrata. 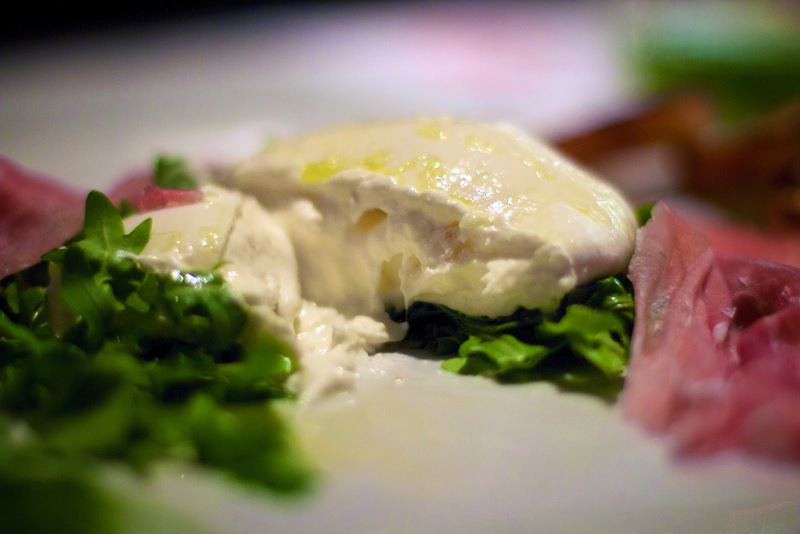 This housemade mozzarella with a cream and truffle center was served in prosciutto and arugula. Amazing! I may have a sensitive palate when it comes to truffle, but this one dish is a reason enough to come back. The texture of the burrata was outstanding. Most restaurants do not make their own, so Brick + Wood is doing something special here. I want more just writing about it. It’s hard to follow up the burrata so I think I didn’t pay too much mind to the Girelli which was a thin mozzarella layered with eggplant, prosciutto, and roasted peppers. It was good, but oh man the burrata. Next came the pizza. There is always an APN certified pizzaiola on the premises. 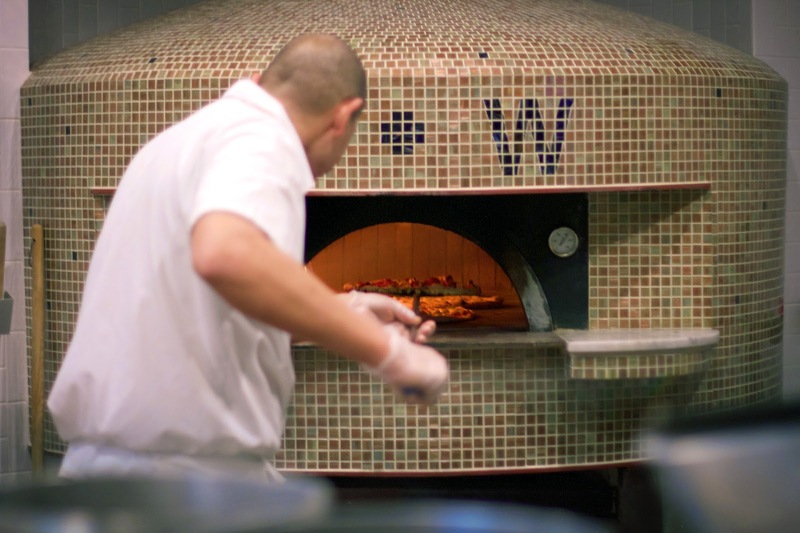 Associazione Pizzaiola Napoletani (APN) is an association formed in Naples by pizza makers to preserve the authentic Neapolitan pizza values. 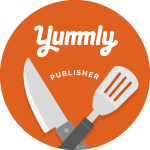 This certification means the pizza maker adheres to strict standards for making Neopolitan style pizza. There are very few APN certified pizza makers in the US. The dough is made from unprocessed Caputo 00 flour. This is the good stuff – finely-ground and lower gluten content. This gives the dough just enough elasticity but not too much. Then each pie is cooked in the 1,000 degree Fahrenheit oven for 60 to 90 seconds. This gives the crust a crunchy yet still chewy texture with a beautiful leopard spotting around the edges. 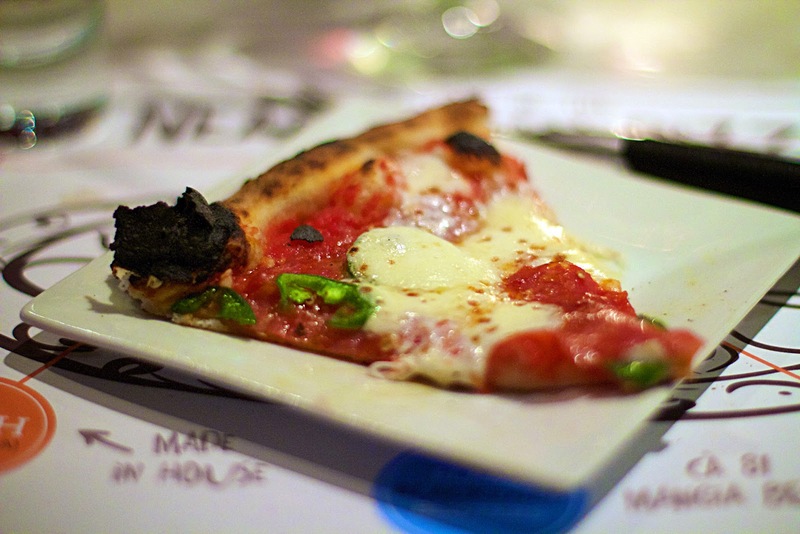 We sampled the classic Margherita, the fresh Arugula and Prosciutto, and the Diavola featuring spicy soppressata, garlic, jalapenos, and oregano. Of course, Diavola was hands down the favorite at our end of the table. It was spicy but not overly so. The spiciness didn’t overpower the actual flavors. More, please. And, as if that wasn’t enough food for one night, we did indulge in two desserts. 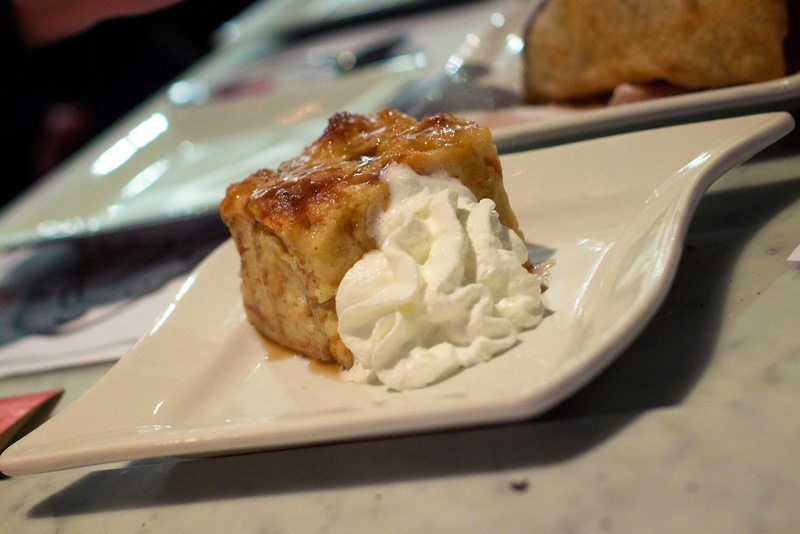 The Caramel Bourbon Bread Pudding was incredibly moist with a nice hint of nutmeg. The Nutella Panzerotto was essentially a fried dough pocket filled with Nutella and bacon pieces. If you happen to be in Fairfield definitely check out Brick + Wood. Even if it’s just a quick stop for a glass of wine and some burrata, you won’t be disappointed. I'm glad I found you on CT Bloggers on FB. This post made my mouth water and excites me to check it out. I write for http://PrettyWellness.com and have a feature on CleanLiving in Connecticut. I would love to showcase this post on its FB page especially what looks to be a clean ingredient pizza. Happy New Year. Fantastic! So happy to connect with you. 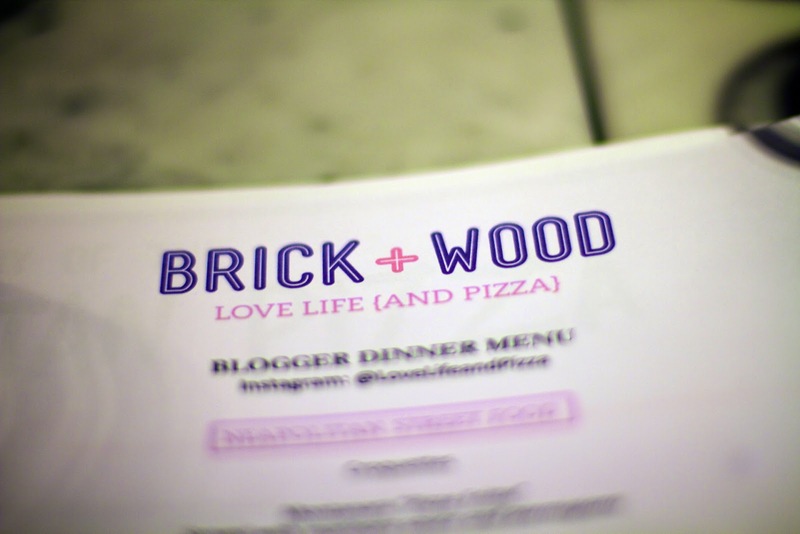 Just ate at Brick & Wood this past weekend, and we loved it! Thanks for suggesting it.